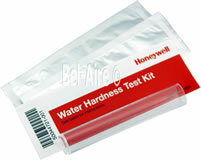 Water quality test kit for determining water hardness and the necessary Honeywell water filter. Each kit includes a test tube and two test strips (individually packaged in foil). Wet the test strip and it will change color. Then compare the color of the test strip with the color chart. 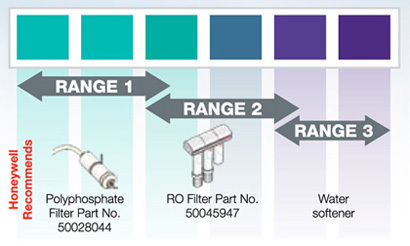 Repeat the test using the filtered water and confirm the results. The term hard water refers to water with a high amount of minerals suspended (dissolved) in the water. This will result in more scale or sediment build-up and with steam humidifiers, boiling further promotes the formation calcium solids.